As the person tasked with making dinner (only because I get home earlier), I’ve been learning how to cook on the job. I’ve always had a knack for baking, but cooking always seemed beyond my abilities. It’s no surprise that when I moved out on my own for the first time, I received quite a few cookbooks including two books titled Help! My Apartment has a Kitchen Cookbook and Where’s Mom Now that I Need Her? True story. 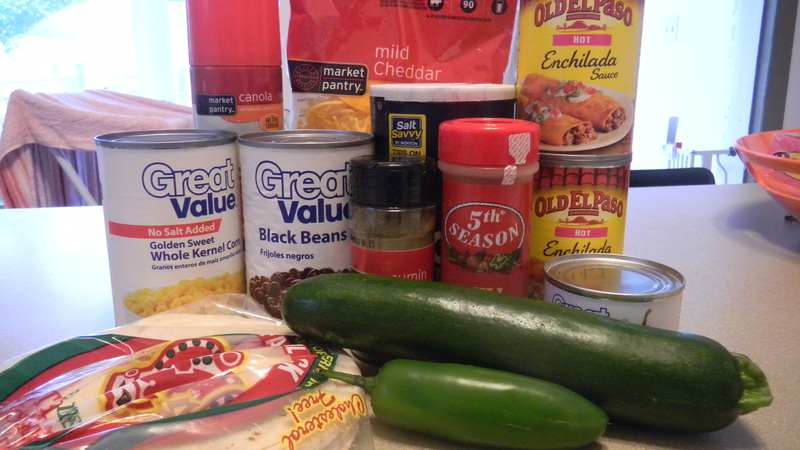 Mexican casserole is a staple in our house, mostly due to how easy it is. It’s a great weeknight meal because little preparation is needed. Oh, and the best part? You can make this the night before, stick it in your fridge, then cook it for dinner when you’re running short on time. This recipe was inspired by Eating Well’s Chilaquiles Casserole. Pre-heat the over to 400 degrees. Take a 9×13 casserole dish and spray each side and the bottom with cooking spray. 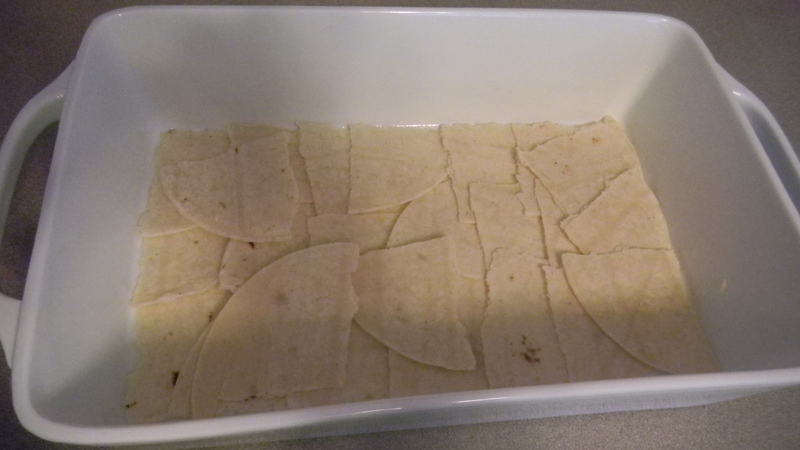 Take half the tortilla pieces and create a layer of them at the bottom of the pan. Set the pan aside. Heat a large pan on the stove. Spray with non-stick cooking spray. Cook the onion for about 5 minutes. 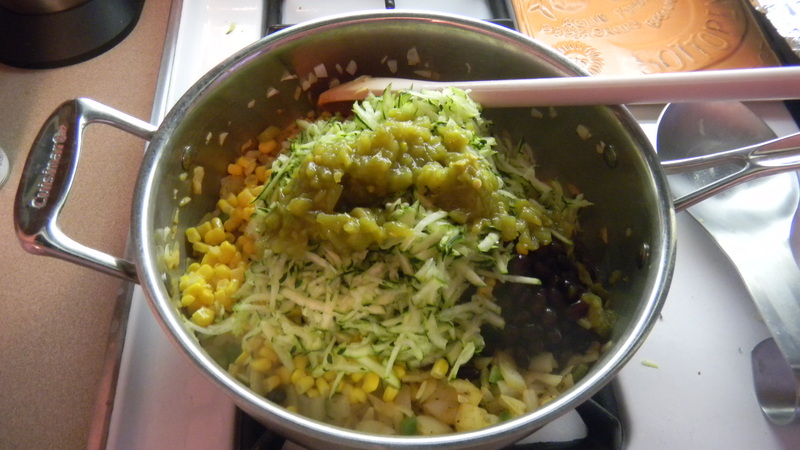 Add in the black beans, corn, green chiles, zucchini, jalapeno pepper, cumin, cayenne pepper, and salt. Stir together until all the veggies have been heated, about 3-4 minutes. You may need to add more cooking spray. Turn the burner off. Put half of the veggie mixture on top of the bits of tortilla. 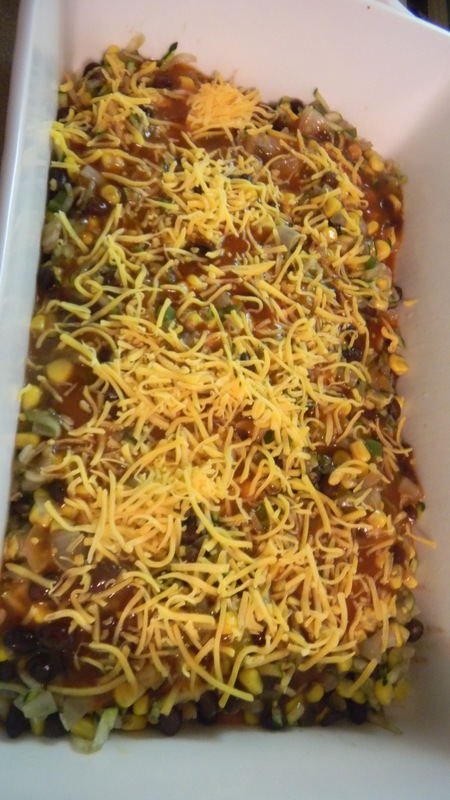 Add half the cheese and one can of the enchilada sauce.Here’s the dish while assembling the first layer. 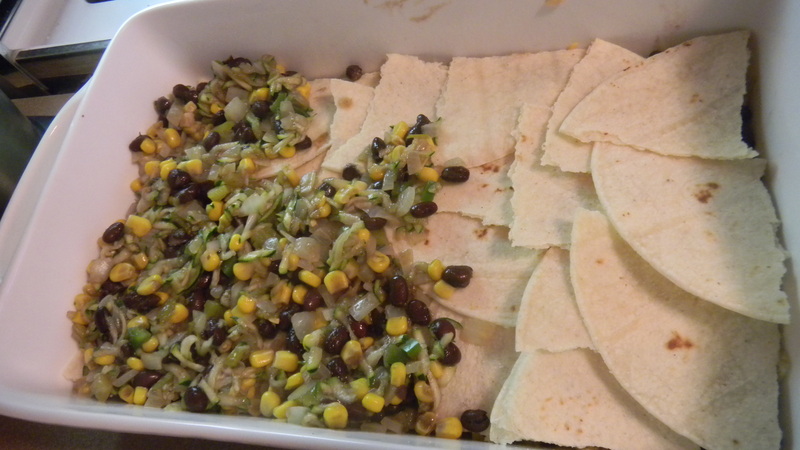 Create another tortilla layer, then top with the other half of the veggie mixture, the rest of the cheese, and the other can of enchilada sauce. Cover the casserole dish with foil. Bake the casserole for about 15 minutes. Remove the foil, then continue cooking for about 10 more minutes. Note: I make this dish rather spicy. To cut down on the heat factor, leave out the jalapenos, green chiles, cumin, and chili powder. You can also use mild enchilada sauce instead. I serve this dish with chips and salsa on the side. 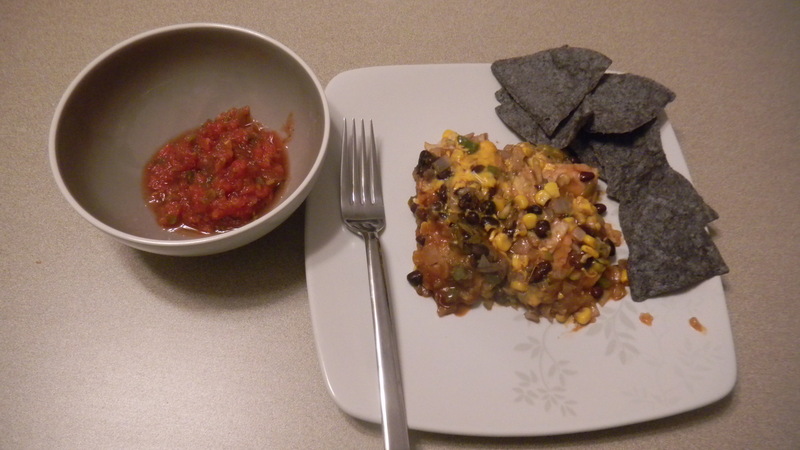 Mexican Casserole also tastes great as a leftover, maybe even better than it did the first time around because the sauce has a chance to really soak into the tortillas. I bring some of the leftovers to work the next day. Heat it in the microwave for about one minute and thirty seconds.